The first most obvious great thing about Google Drive is the ability to access your files from any computer and many mobile devices. This is great for those of us who teach online and/or travel to conferences. At home I have a desktop, which is great for when I am at home, but when we go away, or even out around town, I can’t always help my students. Using Google drive allows me to keep files and other information that I may need to help my students within easy reach at all times. So if I am at a conference for several days, I don’t need to find something to put my important files on, I have them in my Google Drive. But what about security? Is it safe? YES! There are certainly different levels of security which for some files is very important. For the personal google drive, it has the password protection, but you can also set sharing levels. For a business/educational google drive, it not only has the password protection, but an extra level of security through the ‘co rporate’ system. As I mentioned, we can set sharing levels, this is another one of the great things about Google Drive. For a personal account, there are three levels of accessibility. The lowest level, public, anyone can find it using a search engine. The next level, they have to have the link to access the file or folder. The most private for personal, you can set it so only certain people will have access. Another bit about sharing for a personal account, you can also determine if the people can only view or if they can modify it. An advanced option allows the owner to prevent others from changing access & adding people. However, for a ‘corporate account’, you have more options! 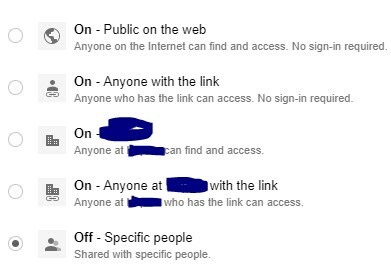 The first tw o and the last options for sharing are the same, but now there are two more levels of privacy! 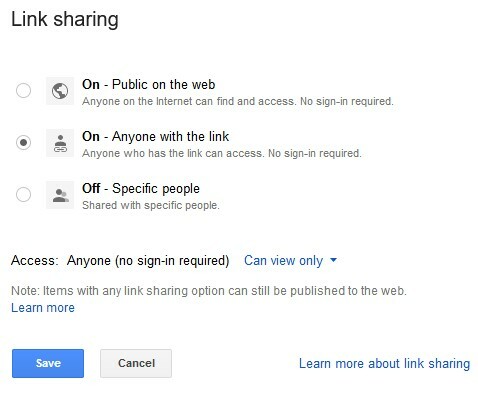 So if you are sharing something specific for your students you can make it so they have to sign in with their school account to be able to either search for it or be given the link. This second one is the one I use with students. If I want to share it with specific instructors I just invite them as well, but they often have edit capabilities in case they want to add a file to the folder. This is again, the same as with the personal account. Yes, you can share not just a file, but a folder. The folder makes it easier to share a group of items with people. So, I have all of the files for one class in a folder and share the link to the folder with my students. I also invite the instructors of the course to edit the folder, so if they have different materials, we can all share, i.e. make the course more Collaborative!